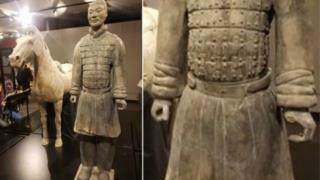 Chinese social media users are voicing their outrage after the prosecution of an American who stole a thumb from a Chinese Terracotta Warrior ended in a mistrial. Michael Rohana, 24, admitted taking a thumb from a statue in Pennsylvania in December 2017. His lawyer argued that Mr Rohana was wrongly charged under laws normally applicable to major museum thefts. This, he insisted, was "youthful vandalism". The trial ended on Tuesday with a 7-5 jury split in favour of an acquittal. The Terracotta Army - discovered in the 1970s by a group of Chinese farmers - is one of China's most important archaeological finds. The 2,000-year-old statue that lost its thumb is worth an estimated $4.5m (£3.2m) and was one of 10 on loan during the September 2017-March 2018 exhibition. In December 2017, Mr Rohana was attending an Ugly Sweater Party at the Franklin Institute when he made his way into the Terracotta Warriors exhibit, which was then closed. Surveillance footage captured him "clowning around" with the statues and taking selfies, before appearing to break something from one before leaving. Museum staff noticed the missing thumb in January and contacted the FBI. They later traced the thumb to Mr Rohana, who admitted that he had kept the thumb in a desk drawer. He was charged with two federal crimes: the theft and concealment of an item of cultural heritage. During the five-day trial at the Federal Courthouse in Philadelphia that ended on 9 April, Mr Rohana told the court that he had made a mistake. "Every time I see this video now, I'm trying to figure out: 'What was going through your mind? What were you thinking?'" he said. "I don't know why I broke it. It didn't just happen, but there was never a thought of: 'I should break this.'" His lawyers argued that the charges brought against him were too severe, with lawyer Catherine Henry telling the court: "These charges were made for art thieves — think like Ocean's Eleven or Mission: Impossible. She says Mr Rohana "wasn't in ninja clothing sneaking around the museum. He was a drunk kid in a bright green ugly Christmas sweater". Jury members were unable to reach a verdict on either charge. Prosecutors will decide by 15 May whether or not to seek a retrial. The Chinese authorities had called for Mr Rohana to receive "severe punishment". Representatives from the Shaanxi Provincial Cultural Relics exchange centre said that in more than 260 cultural exhibitions spanning four decades, it had never seen such a "vicious incident". It said that it would be holding the relevant US departments accountable. Chen Lusheng, formerly of China's National Museum, added that it was "emotionally difficult to accept such a verdict", and that China would be investigating the responsibility of the Franklin Institute under its joint exhibition agreement. Since learning of the mistrial, thousands of people in China have been voicing their outrage on the popular Sina Weibo microblog. "Since he's not guilty, can I also take the Statue of Liberty's torch?" one user says. Another says: "Are those seven jurors idiots?" One user calls it an "international joke". "This American dog doesn't care at all, or understand Chinese cultural relics," another adds. Another says: "So this is what so-called democracy looks like?" What other cases have there been of historic artefacts being vandalised? A Chinese teenager vandalised an Ancient Egyptian artwork at the Luxor temple in 2013 by writing "Ding Jinhao was here" in graffiti.